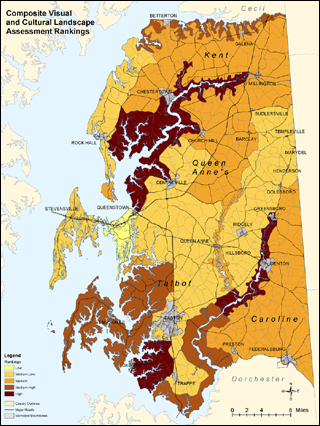 This project was commissioned by Eastern Shore Heritage, Inc. to identify the most significant landscapes and scenic resources within the Stories of the Chesapeake Heritage Area for interpretation, conservation, and promotion of tourism development. A unique assessment methodology was developed to ensure an equitable and holistic approach for assessing both cultural landscape and scenic resources. The four county study area was sub-divided into 25 landscape districts. Each landscape district was evaluated for its ability to convey the interpretive themes of the region, as well as for its visual quality. In 2005 this study received a VAASLA Award of Merit from the Virginia Chapter of the American Society of Landscape Architects and was the subject of a presentation at the 2004 Annual Conference of the National Trust for Historic Preservation. Client: Eastern Shore Heritage, Inc.